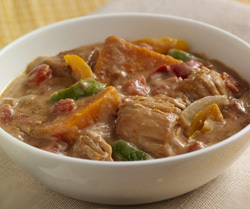 This stew works best with chicken thighs (more fat adds more flavor) but you can use chicken breast if you prefer to keep it leaner. This stew has high flavor. When I make it with chicken thighs, I make it a day ahead of time, so I can refrigerate overnight and let any fat rise to the top so I can skim it off. 1. Heat olive oil in a large pot over medium-high heat. Add onion and sauté until golden, about 10 minutes. Turn heat to medium, add the brown sugar and vinegar and simmer another 5 minutes. 2. Add the garlic, celery, carrot, parsley and the spices and cook 3-4 minutes. Then pour into bowl and set aside while you use the pan to cook the chicken. 3. Add chicken to the pan and brown. Add soy sauce and stir the chicken around in it. 4. Add the vegetables back in, as well as the chicken broth, wine and fish sauce. Gently cook for 30 minutes. Add green beans, stir in and remove from heat. I like them crisp. 5. At this point, I let it cool and put it in the refrigerator overnight, to let the fat rise to the top. I skim off the fat, heat and serve. Note: I don’t like chicken fat, so you may not need to skim the fat. This entry was posted in Uncategorized on May 28, 2016 by goddess.